In today’s fast-paced business environment, we need tools that help us work faster. By creating an automation process using OneDesk’s automation engine, you will reduce manual data entry and process errors by allowing users to preset tasks and automate workflows. You can also set up automatic notifications, prioritize, and assign tasks to team members across your organization. Manage customer service and help desk workflow and optionally define automations to send emails to customers and staff for you. 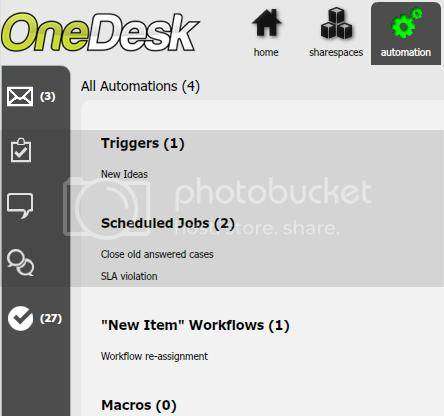 OneDesk allows you to choose from different types of automations to set up an automation process. Here is a description of each kind of automation, and what they can help you with. Click on the links for a detailed lesson on that type of automation. A trigger is a type of automation process that you can use to assign automated actions to any item based on conditions. For example, triggers are a great way to keep customers updated on an item’s progress. Scheduled job automations can be created for items that already exist. This is useful in cases where you would want to set up a recurring action. You may have the system perform that action every hour, 6 hours, or 24 hours. Scheduled jobs are useful when it comes to ensuring that service level agreements (SLA) are met. A new item workflow is a type of automation process in which you set the system to perform automated actions on new items. For example, you can choose to automatically reply to social media. Whenever someone Tweets, Facebooks, mentions you in a blog or blog comment, the automation system will send a response from your social media accounts. You can also set up macros, for one-time automations. For more information about setting up an automated process with OneDesk, and to learn more about the advantages of using the automation engine, view the related tutorials and blog posts below.